Today I was scanning through the auction catalogues and I couldn’t help but notice the price on a property that was going for sale next week at just £13,000! So I bet you’re wondering where on earth can you buy a 3 bedroom property for just £13,000? OK – let me tell you now – it is NOT in Bulgaria – it is in the UK!! And it wasn’t in Merthyr Tydfil or anywhere remotely near the Welsh Valleys or in some remote part of Scotland. No it was in Liverpool – our very own Capital of Culture! Now I know many years ago that you could buy whole streets in Liverpool for just a few pounds, and while house prices may have fallen – they have yet to reach such crashing lows that you buy a house and get change from a tenner. So what’s the catch with this £13,000 house? 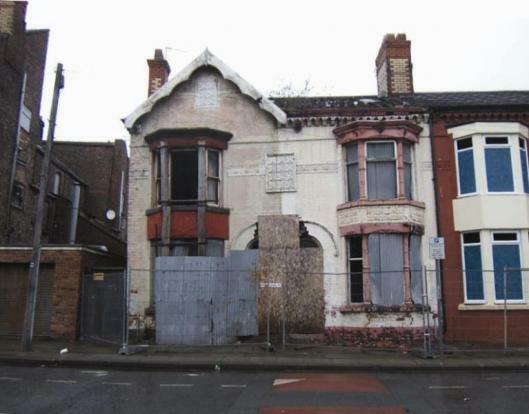 OK so it needs major refurbishment – but that has to be expected for an auction property. It seems to rent for a good predicted yield – typical rents in the area are circa £400 per month. Properties seem to resell there as well – a property in that street has just sold for £45,000. So, I’m OK with all of that – my concern is the neighbour….because sadly the house next door is not up for sale! OMG! What’s the story with the house next door then Sam? The place the other side does not look particularly salubrious either! Why do you say the house is not up for sale Sam? That’s not like you! The very least I’d expect of Ballsey Sam is to find the owner of next door and make them an offer they can’t refuse?! Or contact the empty homes department of the council and get them to do it for you? Maybe that’s a bit too optimistic – what do you think? This looks like the area I nearly bought in, is it Anfield by any chance? If you visited did you get stones thrown at your car (I did). I think it was Kirkdale from memory – does that sound about right Steve? It is less than a mile from the property I looked at, the whole area is one big regeneration zone, areas are numbered 1-5 and I think they are still on Zone 1. Zone 5 (where my prop was)was scheduled to be done by 2015 if I recall correctly but the whole thing was up in the air as it hinges on whether LFC actually move from Anfield. There are many houses like the one you looked at, it looks like a war zone in places. Have a play with “street view”; you may need to go a few streets in either direction but it will be more of the same in a lot of places I’m pretty sure. Hmm sounds about right! So did you invest in Liverpool at all? Errrrr NO. The real bummer was I paid a not insignificant reservation fee that I could not get back in the end. Should have got a sol to check the terms before I paid it and not just when the guy refused to give it back.